XperienceHR is a light-weight HCM tool for global companies that enables a modern interaction between the leaders and their people. Let’s discuss your requirements on a call to see how XperienceHR can help you transform your HR. Discover simple HCM with time tracking, absence management and employee feedback features. 2v1: Attendance in your UP food card. Automatic crediting on your UP food card / food vouchers orders. XperienceHR comes with simple mobile apps for iPhone and Android smartphones that let you request and approved absence and track time on the go. Even offline. Record billable hours, project expenses and employee leaves of absences all in one online tool. Use real-time views, run reports and analyze employee data to understand where the time goes. Empower managers to make informed decisions. Act on the collected data and your findings. 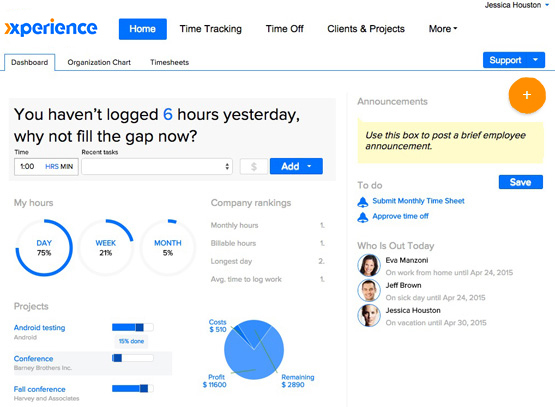 Powerful time and expense tracking features for teams of all sizes. Make sure no billable hour gets missed. Fully customizable to include your country holidays, regional specifics and your company’s leave of absence types. Quick to access and easy to understand, fresh reports are always at your fingertips. Continuous monthly feedback integrated in the timesheet routine. Want to try XperienceHR on your own?